Agile on the Art of Software: An attempt to answer "wondering about project managers"
An attempt to answer "wondering about project managers"
A blog post by Shady "Wondering About Project Managers" triggered me to participate in answering his posted questions. The first question was: Should PMs know the ask much about technical decisions? Maybe this did not answer the question; I will give it another shot: if the PM is truly a servant leader, then there will be trust and hence there will be collaboration where everyone can contribute with knowledge and experience towards the vision and goals of the project/product, towards "success". So yes, within a good team, anyone can ask questions technical or not provided that the discussions are properly facilitated and "waste" is eliminated; a performing team. The second question was: In an agile process, where should PMs stand? What exactly is their Role? Should there be PMs in agile in the first place? Or Should they be replaced by a PO (Product Owner), or -may be- a Scrum Masters? In Agile teams it is not about who can replace who, but I believe it is about who can assume which role(s), and whether the same person can assume more than role or wear multiple hats. I suggest that the role of PM can be split into 2 different roles PO and Scrum Master/Coach. It would ideal to have a person focusing on role of PO (especially for medium and bigger products) and another playing the SM/Coach role (although this role can be taken by any person who "can" do it plus performing his/her role as developer, tester etc..). Role of PO is concentrated with Why and What, while that of SM/Coach is about How and When. Yet collaboration, reflection (on process, tools, features) , and trust are ESSENTIAL. Currently at Santeon , I'm a member of a wonderful team where I carry 2 hats, that of a PO and another of SM. It is not easy though, and I'm learning a lot every day. 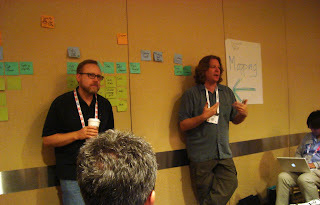 Jeff Patton & David Hussman explaining User Stories Mapping at Agile 2009 in Chicago.